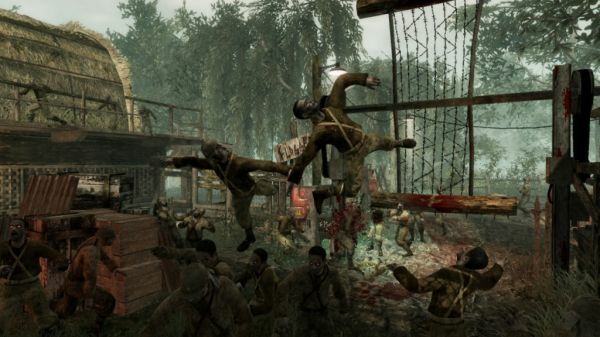 This month we're taking the Activision's Call of Duty: World at War for a spin on the PC. We'll be playing the campaign mode in co-op as well as the ever popular Nazi Zombie mode! With any luck the latest patch will be out providing us with a new four player co-op zombie map! To join up simply hop online on July 21st at 8PM Eastern. Look for the game called "Co-Optimus" to join our crew! We recommend joining our Steam Group and the chat room for to meet other players as well! The Co-Op Experience: The co-op campaign allows players to rank up and unlock perks in competitive multiplayer by completing challenges and earning experience points, adding continuous re-playability and team-based gameplay. There is also a survival mode with Nazi zombies. Players are required to hold a structure by buying weapons, ammo, and fortifying the structure. Co-Optimus.com's Games for Windows Co-Op Nights are an official Games for Windows Event! New Call of Duty Der Riese Trailer is Der Rockin. Here Comes Another Wave of Nazi Zombies !! Page created in 0.2638 seconds.